The Vampire Diaries and The Originals have both returned with new seasons to The CW. The Vampire Diaries, starring Paul Wesley and Ian Somerhalder, has started season seven without Nina Dobrev, and The Originals, starring Joseph Morgan and Daniel Gillies, is facing new challenges in its third season. The Originals began as a spin-off from The Vampire Diaries, but the series has not leaned on Vampire Diaries at all since it premiered. While some faces from TVD have appeared on the spin-off at one point or another, the New Orleans based series has stayed in NOLA and away from Mystic Falls. Klaus only returned once to close out his story with Caroline Forbes. Julie Plec is the woman in charge of both shows for CW, and she spoke about the challenges involved with running both series. She is adding even more onto plate with Containment, which will premiere at midseason. With The Vampire Diaries in season seven, is Julie Plec even considering the endgame for the series? She spoke about that in an interview with The Hollywood Reporter. When Nina Dobrev exited the series at the end of season six, many fans thought the end for The Vampire Diaries was near. Elena Gilbert will return to the series, but only for the series finale. She will need to reunite with Damon, after all. Season seven of the series is taking the characters in a new direction. They are not stuck in Mystic Falls anymore. Caroline was seen engaged to a mystery man and living in Dallas on the last episode. The premiere showed Damon and Stefan in New York City. 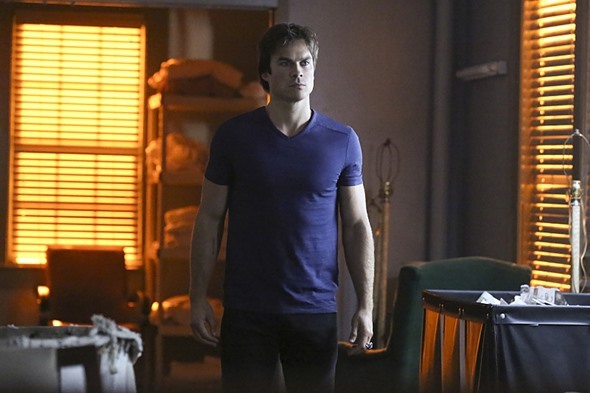 There is no way to know what will happen next on The Vampire Diaries. As for The Originals, that series has introduced new characters this season that give the series a new direction. The battle this season is to keep each sire line alive. Kill one of the three remaining original vampires, and you kill all the vampires they sired over the last 1000 years. How long do you think The Vampire Diaries and The Originals can continue on? Are you still watching these CW shows? Tell us what you think. The Vampire Diaries: Is Season Eight the End for CW Series? I and my whole family watch! Keep it going as long as you can!!! !